NOTE: The views and opinions expressed in this piece are that of my own, and do not necessarily represent the views and opinions of Vinspire or any of it's other contributors. As you may have guessed by now, I love Craft Beer; and my humble opinion has always been that ‘CRAFT’ beer should be about talent, about materials and about the individuals that brew it. Having said that, in my recent review of Chapel Down Wines’ range of ‘Curious’ beer I also agreed that Craft Beer should be about quality values and brewing principles applied to beer. I really am torn, and I find myself today at loggerheads with myself about my apparent ‘double standards’. 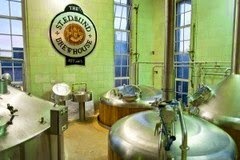 Following the release of Greene King’s Craft Beer range last year, the question I’ve been faced with is whether or not a giant brewing conglomerate and estate owner create a truly ‘Craft’ beer in every sense of the word; and if so, why have they not pioneered the movement and pushed the industry forward? Is it fair for them to jump on the bandwagon, and more importantly, should they? Greene King, in my humble opinion is responsible for some of the most boring and dated beer brands our green and pleasant land has to offer. I was more than a little skeptical when their Craft Beer range was launched this year, and have generally avoided it. But I was in my local off-licence earlier today, and decided to finally jump in and give it a go. How bad can it be? How GOOD can it be? Can it change my outlook? Lets start with how it looks. The branding is great. Classic craft style with a lovely textured labeling and a brown bottle (very important) .The labeling plays on heritage in a fun and creative way, paying homage to the fact that Greene King is over 200 years old. I started with the lightest; the ‘Yardbird Pale Ale’ at only 4%. It had a full fruit, hoppy aroma with a little resin. The taste was a little sweet, with bitter carbonation and a lasting malty finish. It wasn’t as hoppy as I expected, and was more American Amber than Pale Ale in style. Not bad. I continued with the ‘Noble’ English Craft Lager. It poured with vibrant fizz which quickly decipated and looked quite flat. It was paler than any craft lager I’ve ever tried, and characterized by a (nice) interesting zing. It was much, much better than the run of the mill cooking lagers such as Fosters, Carling, Carlsberg etc. I followed with the ‘St Edmunds’; a Cascade-hopped Golden Beer. It poured a beautiful colour and was fresh tasting, but had little character apart from the citrus leant by the hops. It was a little metallic dry on the finish and left me still thirsty. Not great. 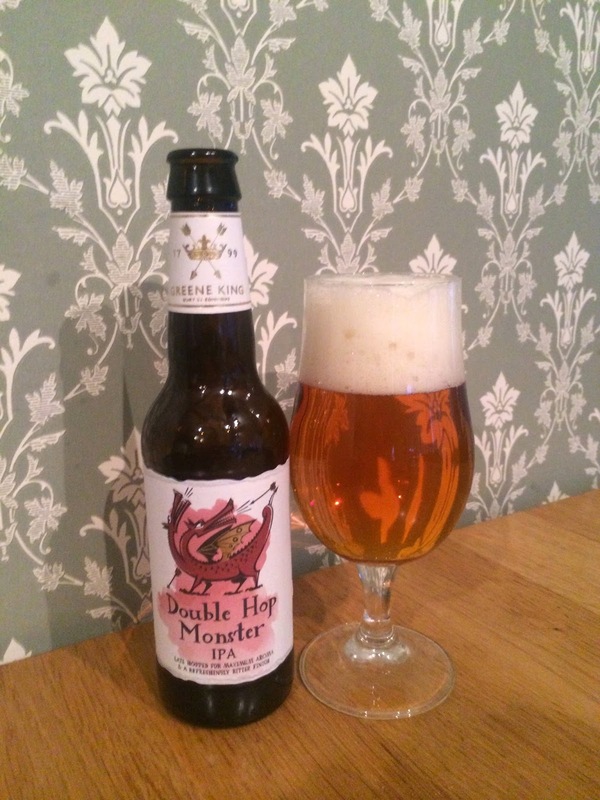 Last but not least (and definitely not least) was the ‘Double Hop Monster IPA’, a 7.2%, late-hopped beer for maximum aroma and bitterness. This should be my thing! The aroma was certainly hoppy, with hints of toffee and grassy citrus. It was a nice orange colour and had a thick white head which laced nicely. Now on to the important part, and, drum roll please……… It was good! Woohoo. Finally! The taste was sweetness with burnt caramel, lots of fresh grass and hops galore. Exactly what I was expecting, and exactly what I wanted. It’s a well balanced IPA for its strength, and had some lovely orange, mandarin and spice notes. Dangerously quaffable, and really rather good! There two other beers in the series, a Dark Ale and a ‘St Edmunds Anniversary Ale’, both 6%, but my local offie was (surprisingly) out of stock. These beers have all got positive attributes, and I always strive to see the good in any beer. It breaks my heart when I try a beer from a small, independent brewer and it’s no good. But this is a BIG brewer. Inexperience and lack of resource are no excuse for substandard beer. The Head Brewer should (and probably is) one of the best in the country, but I imagine his hands are tied by the board of the directors. This strikes me as a range of beers brewed for a market, not for the love of brewing and the desire to impact on customers. It’s to own a share of what’s going on around them; they’re panicking, and it shows. I hate it! At the very least they should be brewing good beer. These beers should reflect Greene King as capable of brewing something with real flavour and talent. It’s not enough to have one good beer out of four. They are so focused on shareholders interests that they’ve followed the game but not the ball. Branding is not why Craft Beer exists. It exists because consumers are bored of bland, uninteresting beers; the branding is defiance and pride in a beautiful product. 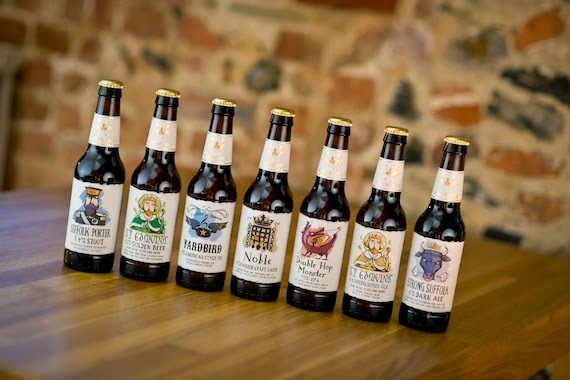 Greene King spent £100,000 researching what customers think of their existing products, and what they should be brewing. They also spent £750,000 on their new Craft brewery. I know of breweries who have started with £50,000 and produce beautiful beer, AND THEY KNOW THEIR CUSTOMER BASE! My frustration is getting the better of me. I’m sorry. I’m not out to slander Greene King. I WANT TO LIKE THESE BEERS. I want my opinion to be challenged by the big brewers, and I want to be proven wrong. I really do! I am disappointed and frustrated. Greene King may experience some success in the off-trade with their range of Craft beers, and some in their managed and leased estate, but they will not be advocated or stocked in good beer pubs, nor will they command a ‘fan club’ or following, and this is why good Craft breweries with great beer, good branding and a true ethos will prevail and continue to tap in to the traditional brewers’ marketplace. And rightly so.